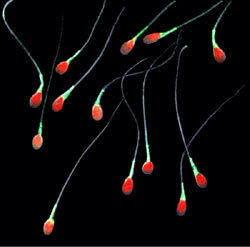 A team of scientists at Syracuse University created the first glow-in-the-dark sperm. They created genetic manipulation to produce fruit flies whose sperm heads glowed either red or green. Afterward they were able to track fluorescent sperm as it was traveling through the reproductive tract of a female fruit fly. This was a huge step in reproduction and fertility technology and scientists were able to observe reproductive events from an entirely new perspective and perhaps it will lead to discoveries in human infertility. Despite research, scientists remain largely mystified about what goes on between insemination and fertilization, and observing glow-in-the-dark sperm will perhaps give researchers the chance to examine every maneuver and every reproductive milestone. The team has already created glow-in-the-dark sperm samples of other animals. This research is truly a groundbreaking because events occurring between insemination and fertilization were previously unobservable. And the findings this study can offer may have huge implications for the fields of reproductive biology, sexual selection and speciation.